Step 3. Launch the platform and fund your account to start trading. Does Fondex offer a swap-free (Islamic) option? Is my live account going to close if it has zero account balance? Fondex doesn’t close any live accounts except if a client asks for it. What supporting documents do I need to provide so that my account is approved? How do I upload my Proof of Identity and Proof of Residence? Click the “Activate account” button at the bottom left of your screen. Fill in your personal details and questionnaire. Click on the drop-down arrow next to the Account information on the top right of the screen and select “Trading Accounts”. A new window will appear as per the screenshot below. Please fill in your personal details and choose your deposit currency, leverage and account type. Please note that there is no limitation in the number of accounts a client can open. Do I have to download any software to start trading? You can trade on Fondex cTrader Web, Desktop or our Mobile app. You can access and download any version of Fondex cTrader by clicking here. You may open a Demo account directly via the Fondex cTrader platform. A new window will appear as per the screenshot below. Please select “Demo Account”, fill in your personal details and choose your deposit currency, deposit amount, leverage and account type. Is it possible to lose real money while trading on Demo? No, you only use virtual funds when trading with a demo account and therefore you cannot lose any real money. 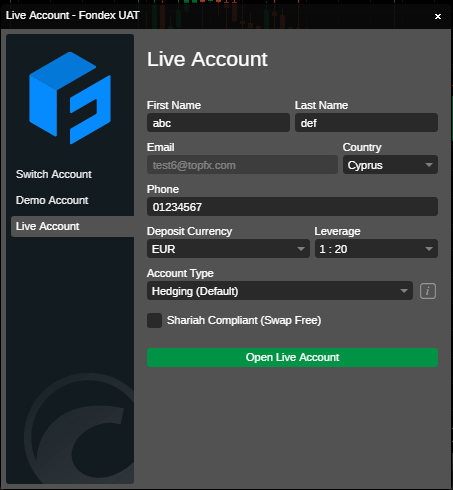 How do I switch between my accounts on the Fondex cTrader platform? You can easily switch between accounts, either live or demo ones. 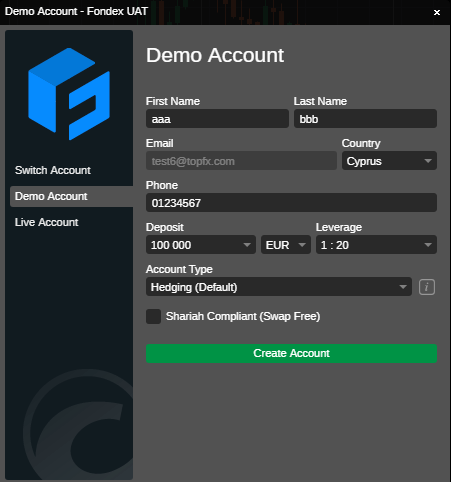 Click on the drop-down arrow next to the Account information on the top right of the screen on Fondex cTrader web and choose which account you would like to trade with. Fondex has taken all necessary precautionary measures to ensure that the personal details of our clients are held in absolute confidence and are securely stored so as not to be accessible by unauthorised persons. Do you accept US citizens? No, we don’t. According to the Dodd-Frank Act passed by the US Congress, the Commodity Futures Trading Commission (CFTC) doesn’t allow us to let US residents open trading accounts with us. We apologise for any inconvenience caused. If you do not have any open positions in your account, please send an email to backoffice@fondex.com or support@fondex.com requesting the account closure. Your request must be sent from your registered email address. Do I need to update my personal information should these change? If any of your personal details change, i.e. expired ID or address change, you must let us know. Please email our Support Team to update your details.